Sleep Apnea & Grinding Can Be a Thing of the Past – & You Can Thank the DNA Appliance for That! What do sleep apnea and tooth grinding (bruxing) have in common? They’re both signs that you’re not getting enough air. With apnea, you’re repeatedly choking and jolting awake – the body’s emergency response to a blocked airway. With bruxing, you’re often just trying to get your jaw into a position that lets you take in more oxygen. 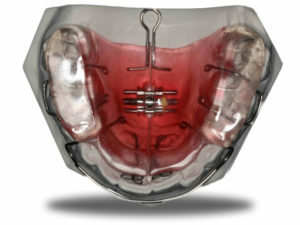 Typically, apnea treatment includes either wearing a CPAP device during sleep or an appliance that keeps the tongue from falling back into the airway. Bruxers are given nightguards. While these all can improve sleep to varying degrees, neither addresses the root of the problem. But recent technology has brought us a new kind of therapy that actually lets us treat the cause and provide long-term relief: the DNA appliance. This device takes advantage of the wealth of stem cells you have in your jaw joints and tooth sockets. By stimulating these cells, we can enlarge the oral cavity and airway, making it easier for you to breathe freely and consistently during sleep. The added benefit is a boost to your overall health. Research has consistently shown a relationship between sleep disordered breathing and problems such as chronic pain, high blood pressure, stroke, depression, memory issues, lower immunity, and stroke. It’s also shown a lowering of risk when the body gets more oxygen. We’re proud to offer this cutting edge technology in our office. Ask us about it at your next appointment! Dr. Miloslavskiy has been instrumental in making me aware and urging me to have a sleep apnea test. I have been diagnosed with obstructive sleep apnea. I have started using a CPAP and it is a bit difficult to get used to, but I noticed I am no longer grinding my teeth at night. Not at all. No other doctor or dentist in my 68 years has ever mentioned sleep apnea to me. I am truly grateful for Green City Dental’s thoroughness in my treatment and look forward to amalgam removal and maybe feeling so much better. Thank You All.